Also referred to as live migration, the live VM migration mechanism is a system that is capable of relocating virtual servers or virtual server instances at runtime. 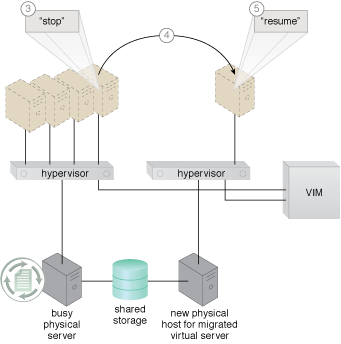 A virtual server capable of auto-scaling experiences an increase in its workload. The VIM decides that the virtual server cannot scale up because its underlying physical server host is being used by other virtual servers. The VIM commands the hypervisor on the busy physical server to suspend execution of the virtual server. The VIM then commands the instantiation of the virtual server on the idle physical server. State information (such as dirty memory pages and processor registers) is synchronized. 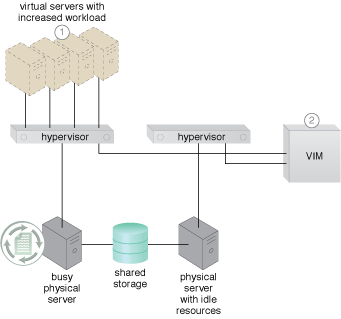 The VIM commands the hypervisor at the new physical server to resume the virtual server processing. Figure 1 – An example demonstrating live VM migration (Part I). Figure 2 – An example demonstrating live VM migration (Part II).